Styling has been taken to a new level by a developer at Kangaroo Point, with buyers being offered up to $70,000 to spend at design powerhouse Coco Republic. DevCorp, the developer behind the $100 million high-end development Lume, at 25 Shafston Avenue, has done an exclusive deal with Coco Republic to ensure its owners apartments are beautiful inside and out. DevCorp managing director Murray Thornton said each apartment owner that bought from the newly launched premium collection of north-facing apartments to be released this week, would receive a free initial consultation with interior design specialists as well as a voucher to be spent on any Coco Republic products or services. “Partnering with Coco Republic befits Lume’s air of luxury and sophistication,” Mr Thornton said. Vouchers valued at $70,000 will be issued to buyers of three-bedroom apartments, $25,000 for two-bedroom apartments and $12,500 for one-bedroom apartments. “It means buyers can tailor their apartments with exceptional design pieces and international brands,” Mr Thornton said. The premium collection apartments have been designed exclusively for the owner-occupier with luxury upgrades, dual living areas and floor plans that can be customised to suit individual buyers and extra storage. Coco Republic executive director Jeremy Byrne said the Queensland collaboration was a first for the company. 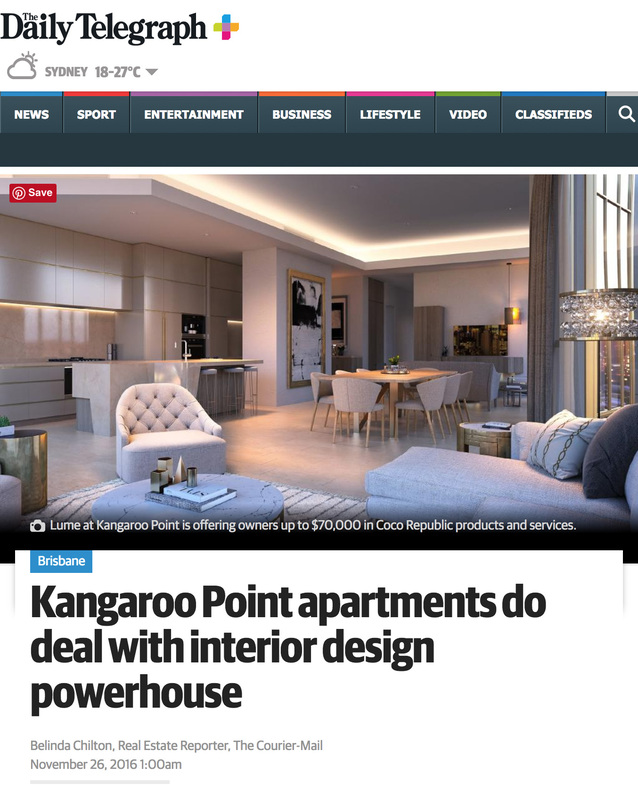 “Coco Republic are delighted to be partnering with DevCorp on Lume Kangaroo Point, undoubtedly one of the most exciting luxury developments in Brisbane,” Mr Byrne said. The partnership is supported by an exclusive event to be held at Coco Republic, Wickham Terrace, Fortitude Valley, from 6.30pm on November 29. Lume, comprising 119 executive apartments across 13 levels, is within walking distance to the Brisbane CBD, South Bank, Woolloongabba and New Farm. It features a 13th floor sky lounge with an infinity-edge pool, open air entertainment terrace and fully-equipped gymnasium and offers stunning views of the Brisbane skyline, Botanic Gardens, Brisbane River and Story Bridge.